Celebrated across the continent for its awe-inspiring syntheses of Chinese and Western musical traditions with elements of world, new music, creative improvisation, and multidisciplinary art, Vancouver’s Juno-nominated Orchid Ensemble has always pushed the creative envelope in enthralling fashion. The JUNO nominated Orchid Ensemble’s 3rd CD features original compositions and new arrangements of traditional music inspired by contemporary and ancient poetry of diverse cultures. The musical influences range from Chinese traditional, western classical, Balkan fusion, to Indonesian gamelan, covering the genres of instrumental, vocal, choral and electroacoustic music. The CD is accompanied by a poetry booklet, with the poems and text that have inspired the music in its original languages of Chinese, Spanish, Hebrew and English. 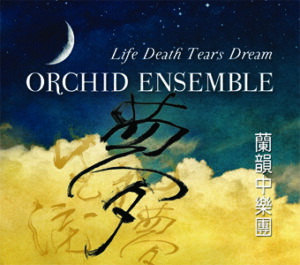 On Oct 30, 2012, Orchid marks its 15th anniversary by releasing its most adventurous album project yet:Life Death Tears Dream, a collection of cinematic, contemplative, and otherworldly compositions, inspired by contemporary and classical poetry from China, Taiwan, Spain and the Jewish diaspora. Liberated from the constraints of a musically-defined theme and free to venture as far as its poetic inspiration will take it, the ensemble creates a wildly diverse yet cohesive fusion of East and West, composed and improvised, ancient and modern. The album’s opener, “Dancing Moon,” is like a sprightly romp-through-an-open-field in which ensemble artistic director Lan Tung pauses to sing the words of the Tang Dynasty poet Li Bai. “Ay La Llamo” is a mournful traditional flamenco song interpreted with the utmost anguish by Japanese flamenco singer Kei Ooka. “Al Kol Hama Asim” and “Hyot Hakodesh” are works by Moshe Denburg, the founding artistic director of the Vancouver Inter-Cultural Orchestra. Both draw inspiration from mystical Hebrew hymns. The title track, “Life Death Tears Dream,” selected from the ensemble’s choir collaboration repertoire, is based on a Taiwanese contemporary poem contemplating the cycle of life. The poetic ideas in the text inspired the musical structure of the piece, which evokes gamelan music. And “Ghostly Moon” is an ultra-modern composition by Barry Truax. It blends acoustic and electro-acoustic elements into a surrealistic soundtrack for a traditional Chinese-style ghost story — derived from poems from the 16th to 18th centuries. The piece was commissioned by the Orchid Ensemble for the 2008 multidisciplinary performance Ghost Project, which explores how different cultures conceptualize the afterlife. Life Death Tears Dream is the follow-up to the Orchid Ensemble’s Juno-nominated 2004 album the Road to Kashgar, a collection of music inspired by cultural interaction along the Silk Road. The genesis of the new project lies in the ancient ties between Chinese music and poetry and in the ensemble’s ongoing collaborations with poets, calligraphers, composers, dancers and visual artists. The musical influences range from Chinese traditional, western classical, Balkan fusion, to Indonesian gamelan. The CD is accompanied by a poetry booklet, with the poems and text that have inspired the music in its original languages of Chinese, Spanish, Hebrew and English. The fast 5/4 melody is inspired by a folk song from south west China. To contrast with its constant motion, a number of gestures for improvisation are inserted, taking inspiration from a Chinese classical poem praising the moon hanging high over the mountains. The piece ends in a fast 9 beat cycle and a series of modulations, inspired by Balkan music. y dónde se vino a poner? where did she come to set herself? In a set of four vignettes, based on the four short poems by Taiwanese contemporary poet Hsiung Hung, the piece completes itself as a song cycle – both musically and philosophically. The first two movements are performed continuously in cycles: life-death-life-death-life. The poetic ideas in the text inspired the musical structure and evocates Gamelan music. This piece was commissioned by the Egret Music Centre to perform with the Orchid Ensemble. The original version for erhu and 2-3 percussionists was written as the theme song for a short film Chinatown. The simple haunting melodic line is contrasted by the polyrhythmics in the zheng and percussion parts. The theme is based on a mystical hymn, chanted on the Sabbath day: El Adon al Kol Hama-asim (God, Ruler over all Creation). Many mystical and kabbalistic references are found in the text. However, the variations are presented first, and only finally the original theme itself. Therefore, the movements are subtitled as they appear in the hymn, but in reverse order. Composed for Orchid Ensemble’s interdisciplinary show ‘Triaspora’, Cocoon extends the use of colourful chromatic lines , weaving harmony and melody into a swirling mass of sound. The short quick Allegro at the heart of the piece is a frantic release from the brooding, mystic atmosphere at the beginning and ending of this trio tableau. The Ghostly Moon is a music theatre work inspired by the tradition of Chinese ghost stories, many of which are centred on a female ghost who wishes to return to life. In this case, the story combines elements and poetry from many different sources from the 16th to the 18th centuries, and portrays the ghost as a wronged woman who returns for vengeance. However, the young scholar she visits is the brother of the man who betrayed her, and once she hears his voice she realizes this is her true lover. To return to life she must join with him as his wife, which is the outcome of many of the traditional Chinese tales. The disembodied theatrical effects from traditional Chinese drama suggested a contemporary treatment with electroacoustic techniques. The work was commissioned by the Orchid Ensemble and is dedicated to them. The voices heard on tape telling the story are those of Kathy Borneman and Chris Grigor. The composer is indebted to Prof. Judith Zeitlin of the University of Chicago whose book, The Phantom Heroine, provided much inspiration and several of the poetic translations. On this CD, the zheng was performed by the Orchid Ensemble’s previous member Haiqiong Deng. Haiqiong, an internationally renowned soloist and chamber musician, has given numerous performances and lectures at concert halls, universities, museums, and festivals throughout the United States, Canada, China, Japan, and Singapore. Her discography ranges from solo, ensemble, concerto, and cross-cultural works which are released by Sony, BMG, BIS, Delos International, Capstone Records, Tribal Record, and Celebrity Music. She is also the featured artist in the chapter on Chinese music in the widely used textbook World Music: Traditions and Transformations (McGraw-Hill, 2007), by Michael B. Bakan. Haiqiong received her Bachelor of Music degree from the Shanghai Conservatory of Music, and Master of Arts in Arts Administration and Ethnomusicology from the Florida State University College of Music. She is currently the Director of the Chinese Music Ensemble at Florida State University.